Meeting up with my friend Rosanna this weekend reminded me that I had not yet posted about a recent walk in North Yorkshire. 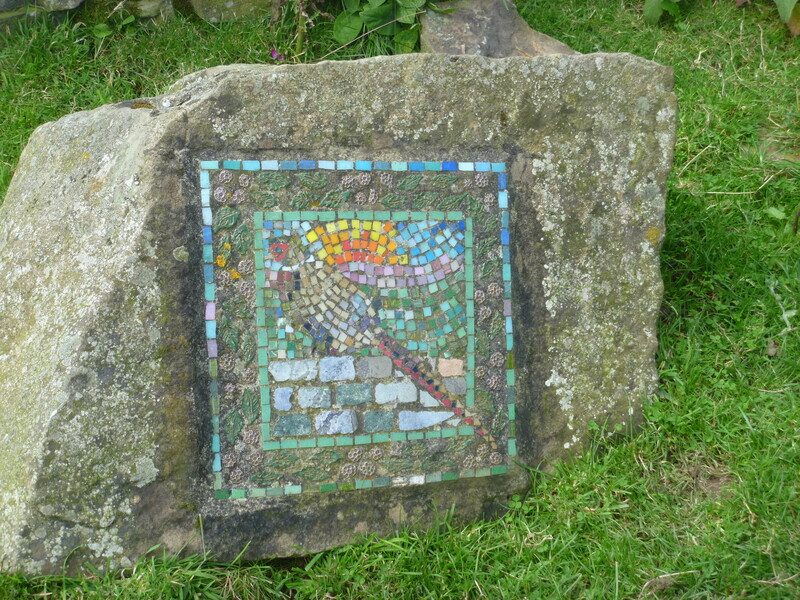 Rosanna is a Mosaic Artist and she designs and produces (and sells) her lovely craft work. 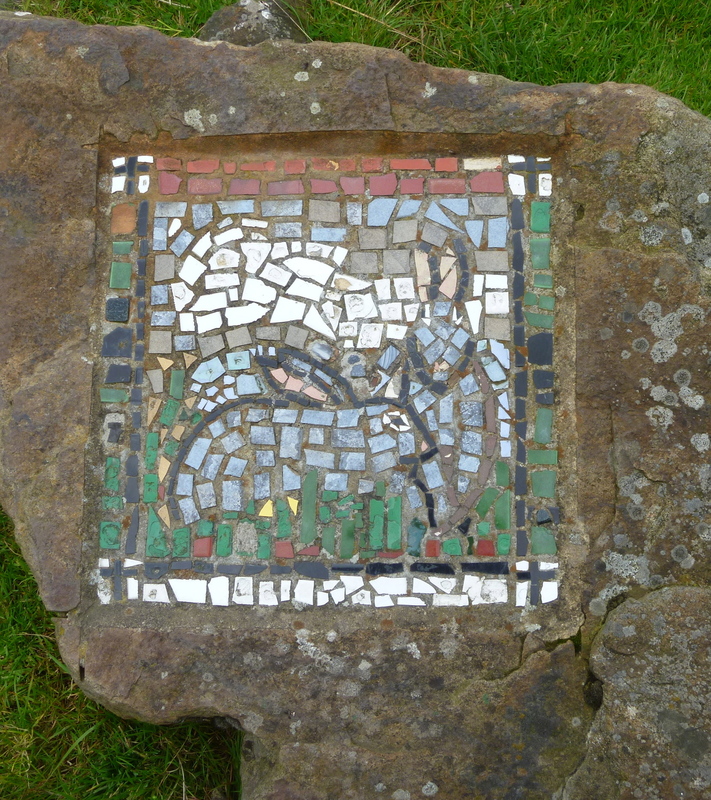 You can read about her and her work here. 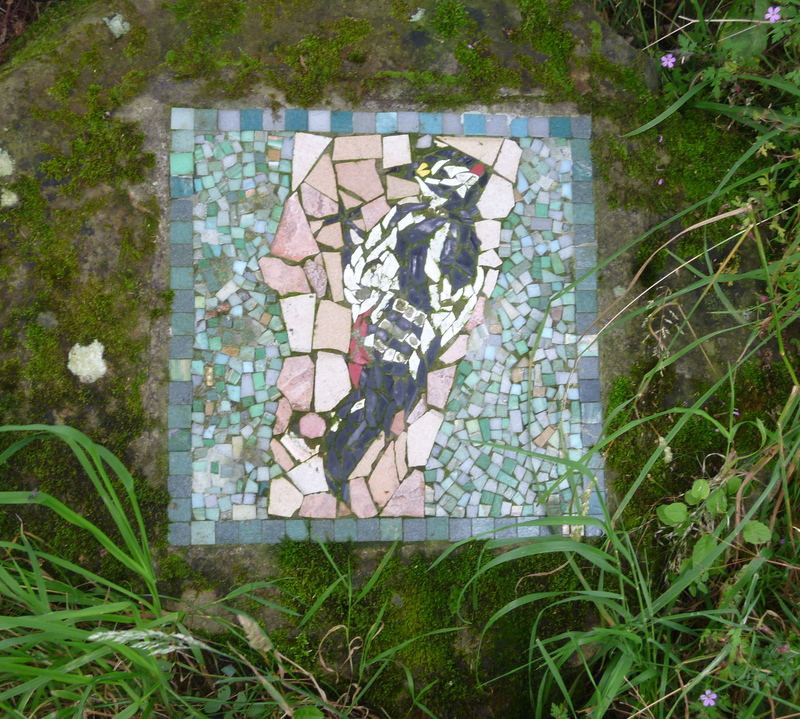 It was when I was looking at her nature mosaics – birds and other creatures that I was reminded of the walk I lead one Thursday in August : The Crackpots Mosaic Trail. 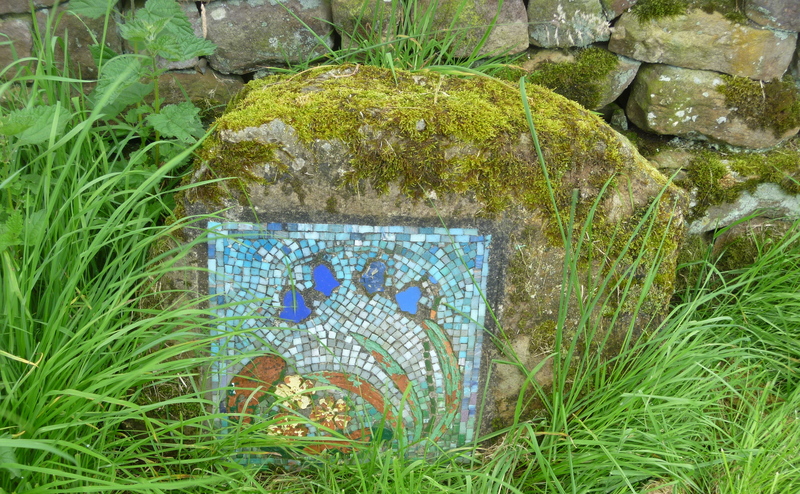 The six and a half mile trail starts several miles northeast of Pateley Bridge in the Nidderdale Area of Outstanding Natural Beauty. 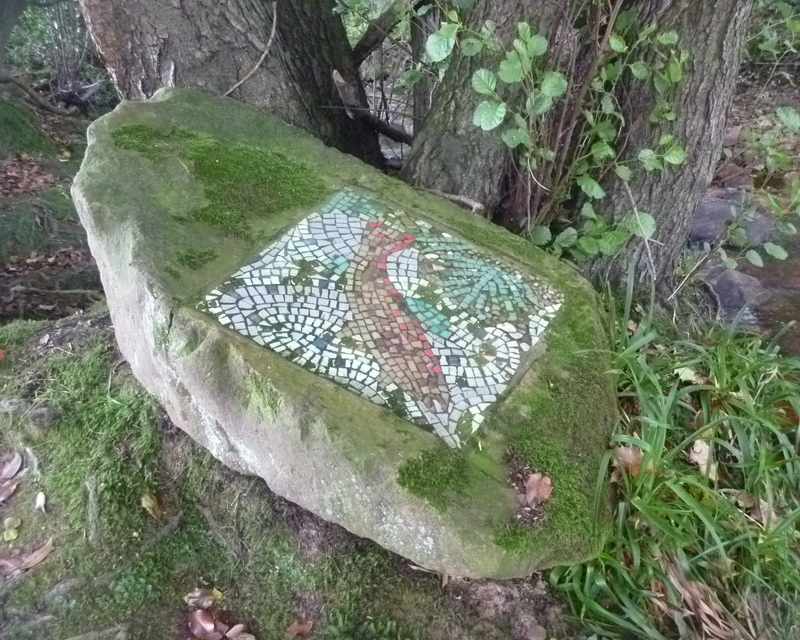 Indeed it was to celebrate this designation that a local group of crafts people decided create the trail. 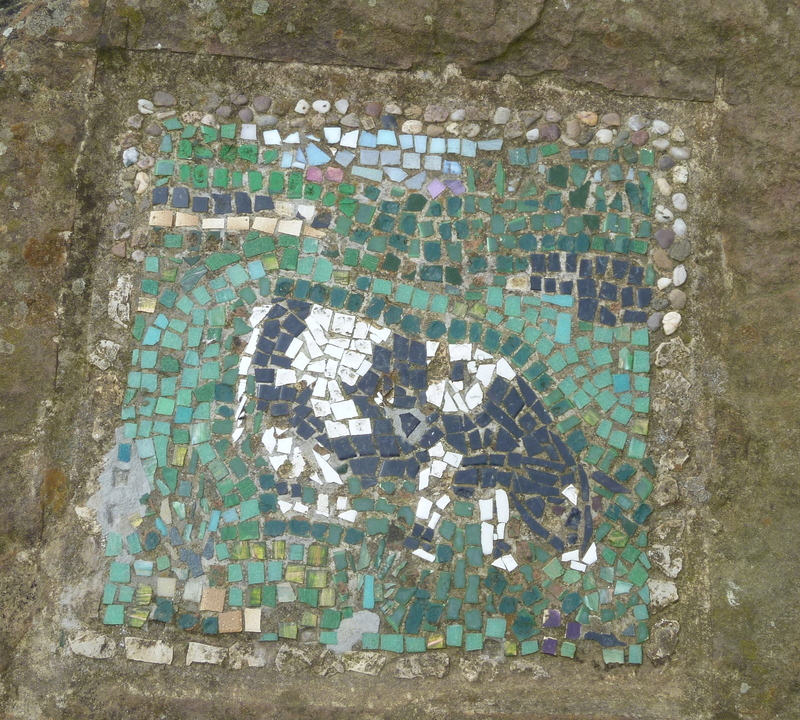 In all there are 22 mosaics and a leaflet has been produced with the trail notes, map and brief description of each mosaic. 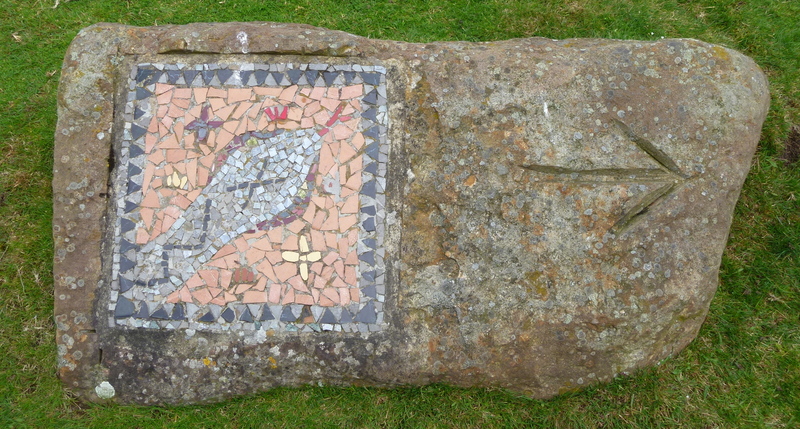 I chose that we parked near to the ‘first’ mosaic but there’s a car park by the ‘last’ one. From here, and it’s a pretty exposed windy spot, we were soon branching off the road onto a moorland track. 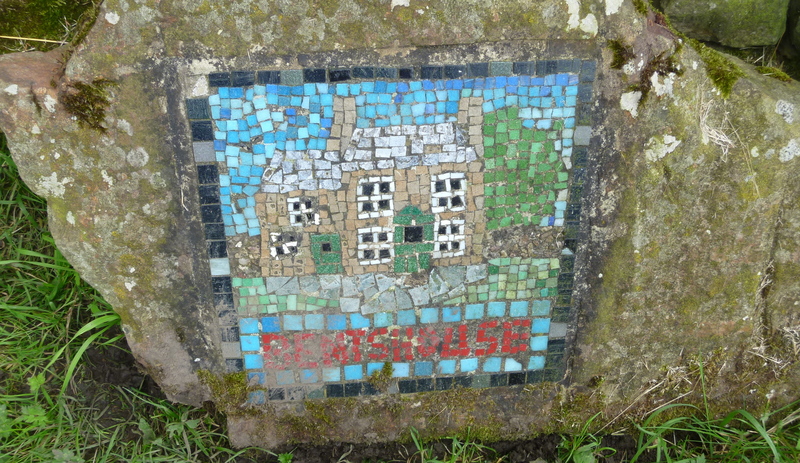 This track takes you along to numbers 2, 3 and 4 then, on a track through the hamlet of Carlesmoor, you come across the first non-nature mosaic : number 5 The Potato House. 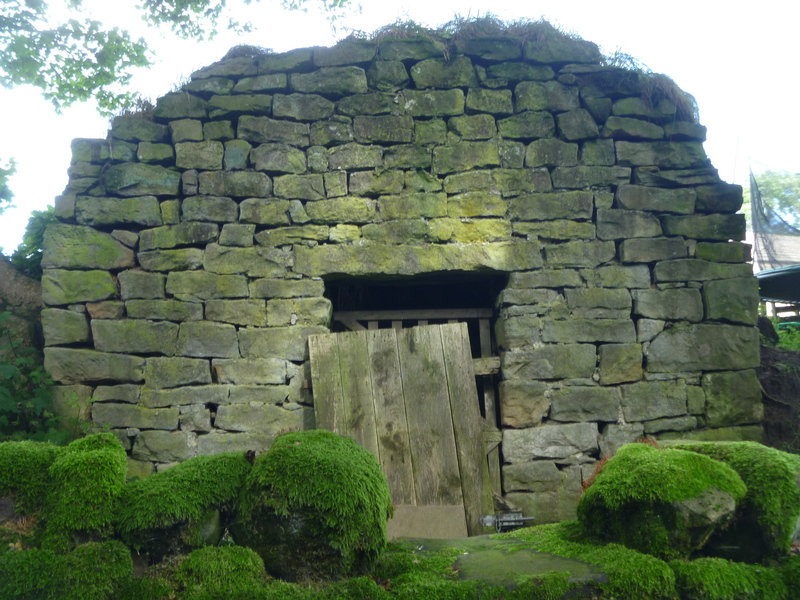 Known locally as “taty houses’ it was/is used for storing … potatoes. 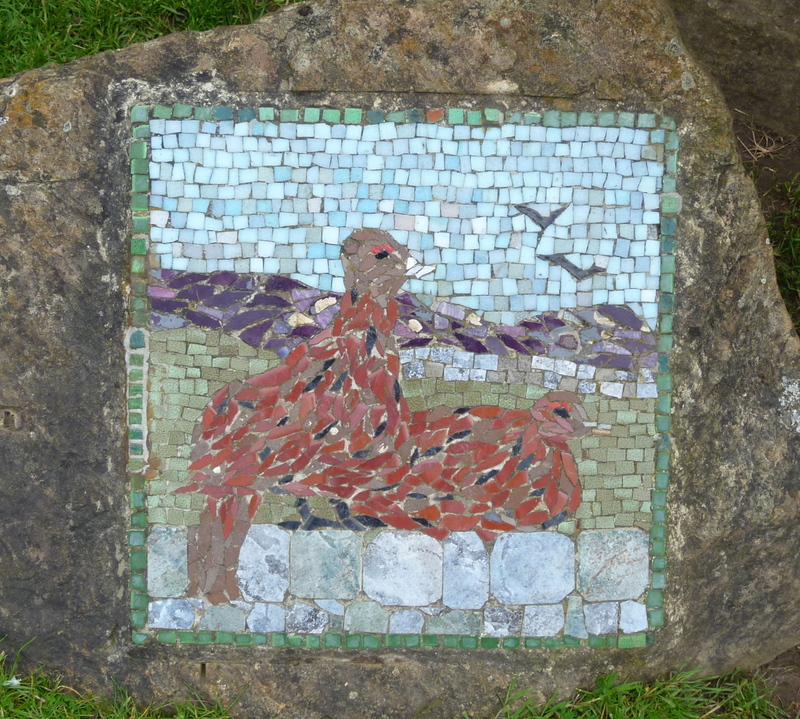 The next mosaic illustrates The Sighting Tower which stands on a nearby hill and was built to achieve the level for a tunnel from Round Hill Reservoir for Harrogate’s water supply. 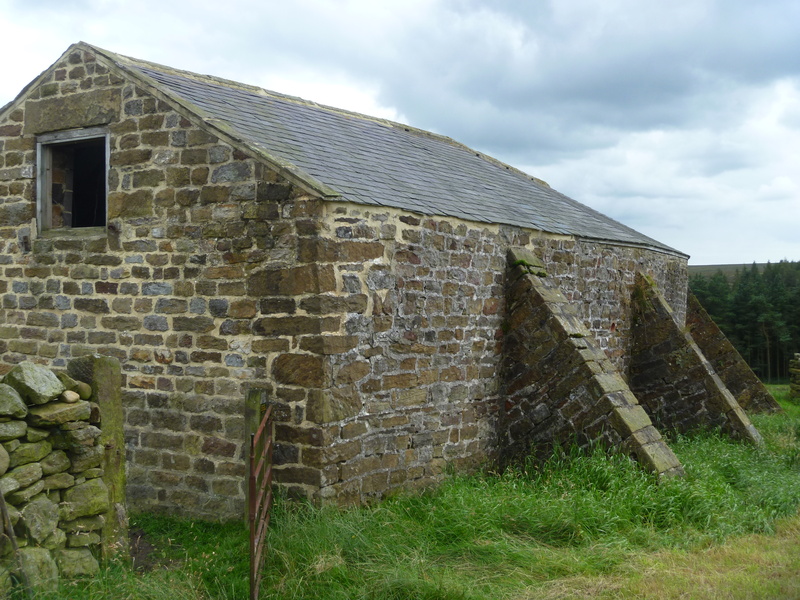 We rejoined the road briefly and then took a track/bridleway which also appeared to be a water conduit and was therefore rather muddy, even at times of dry weather. Each ford we crossed though had its own footbridge, which was handy. 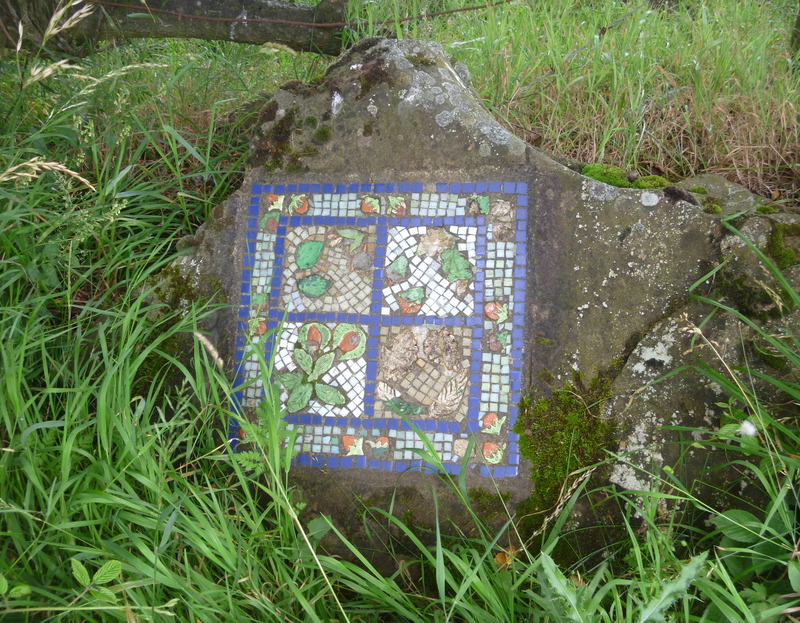 Mosaics 8 to 12 indicated that we were on the right track and some were also indicative of local dampness! Eventually we joined a country lane and then briefly had to walk along the side of a busyish road. There’s a pub by the road, The Drovers Inn, but it was closed on the Thursday when we passed by. This being the case we decided anyway to stop and eat our lunches at the handily placed picnic tables. 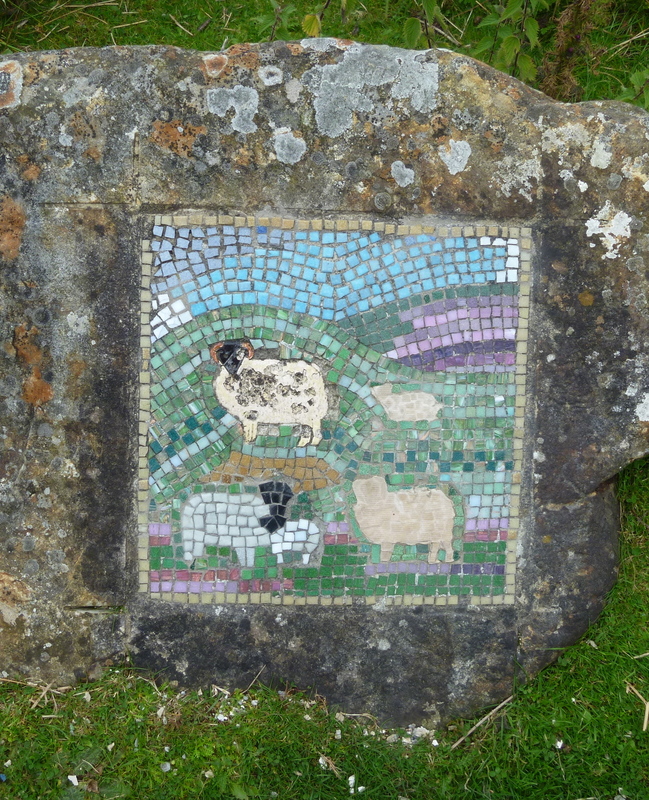 The Drovers has its own mosaic set on a rock by the roadside. Free House. 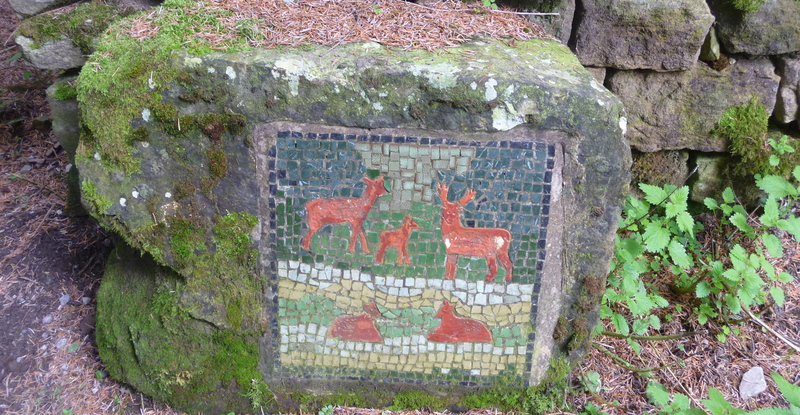 Locally and affectionately known as ‘The Little Drovers’. Not technically in Nidderdale but an allowable indulgence as the characterful Drovers Inn has strong connections with the dale, lying about five miles or so eastwards from Pateley Bridge at the far end of Dallowgill Moor. An isolated moor edge pub notable for its tiny ‘living room’ 1960’s feel bar. 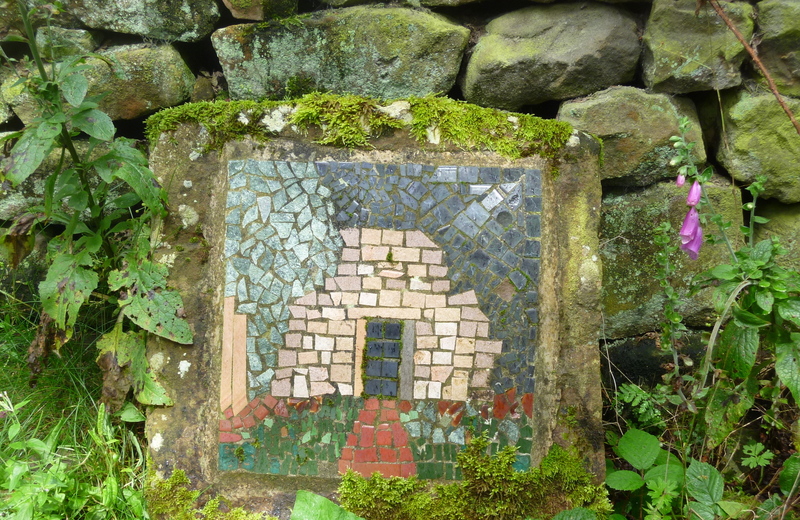 The pub is owned by Dallowgill shooting estate and as such remains unspoilt and un-commercialised. Closed all day Mondays. 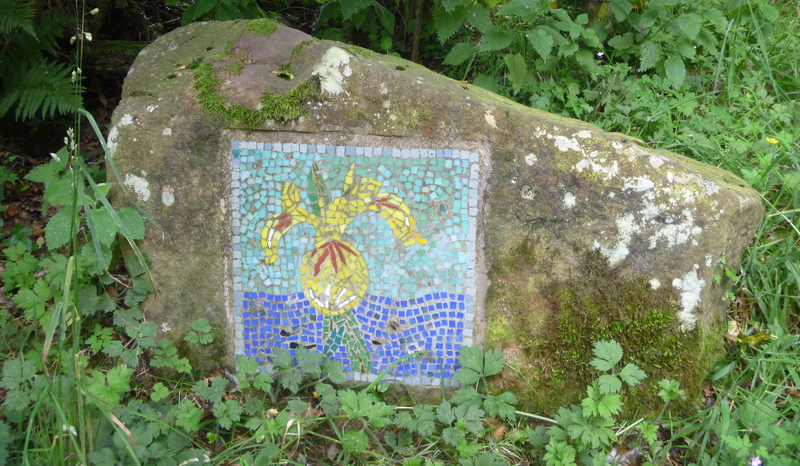 Refreshed, we moved on along this road for probably just under a mile and by Castiles Farm another track (with its own mosaic of bluebells) led off down to Dallow hamlet. There we met the ‘stick man’. 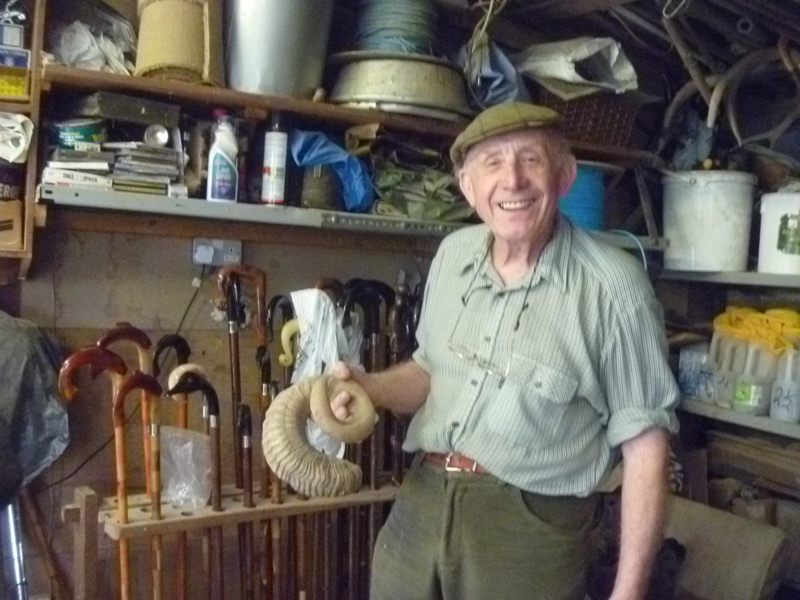 He showed us a wonderful collection of sticks that he made – each one different from the next. The pub is owned by the Dallowgill shooting estate so indeed is the hamlet of Dallow and our stick maker Terry Holman is a beater. From the ‘Glorious Twelfth’ (of August) he’s a beater or some such for the estate up on the local moors and (he told us) his business is put on hold for 12 weeks. 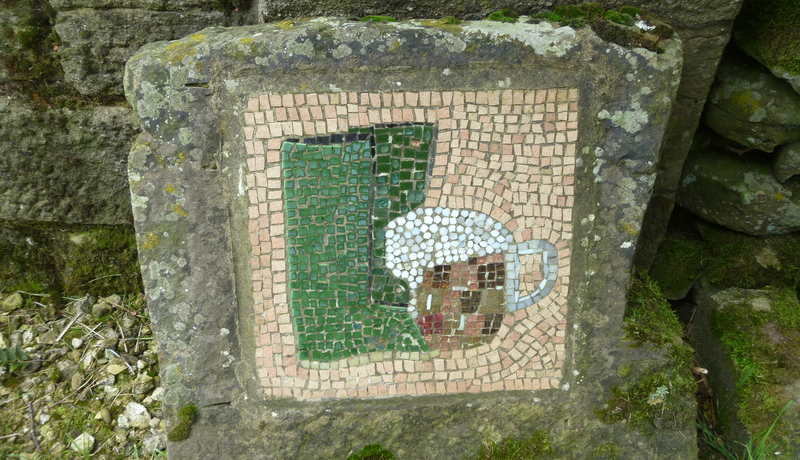 to another (Pete’s Place) and finally a last climb up to the road where lies the final mosaic (and a car park). Our own parking place was just a few paces on from this. 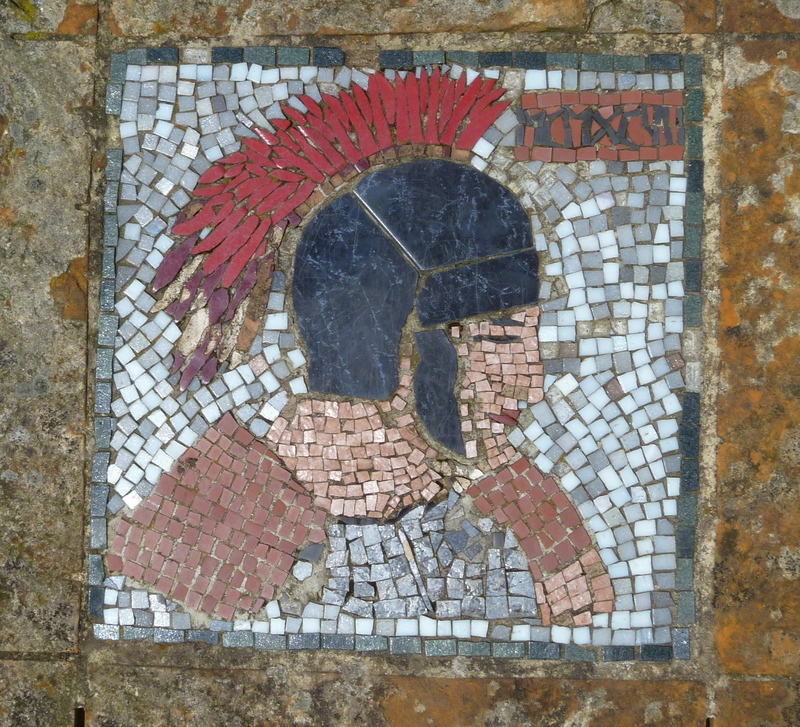 The final mosaic is of a Roman soldier whose remains were found on Grewelthorpe Moor and buried in Kirkby Malzeard churchyard. 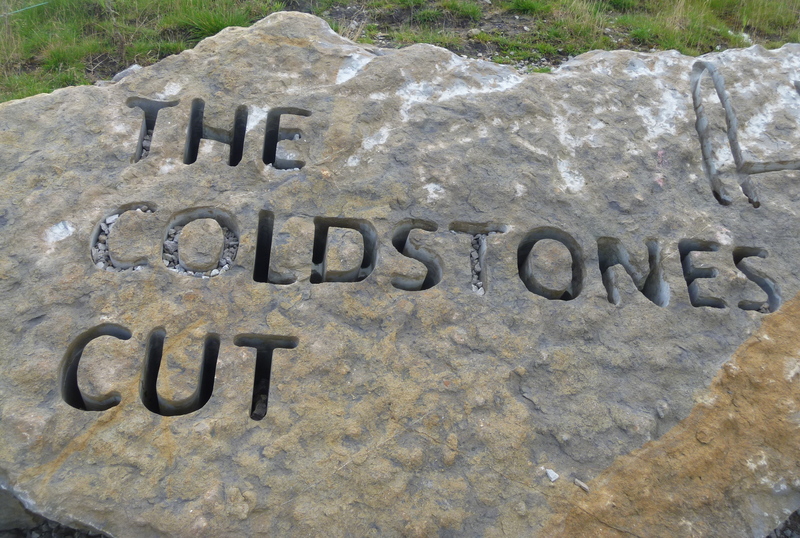 This being a shortish walk for the group we drove home via The Coldstones Cut a “monumental sculpture for spectacular views of North Yorkshire” (leaflet). 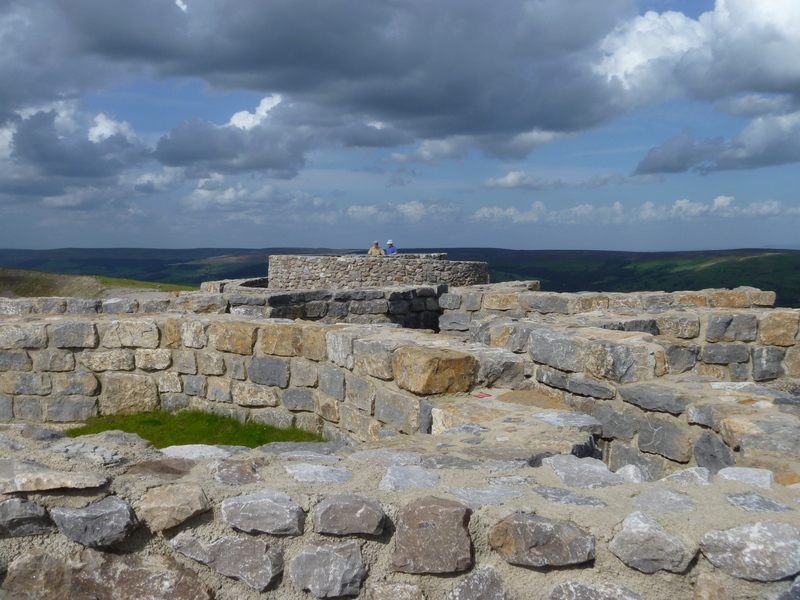 Just outside Pateley Bridge on the B6265 road to Skipton there’s a free car park and its a toughish climb up but well worth the effort for the views and the panorama that awaits you. The orientation ‘table’ set in the wall top indicates the direction to locations near and far and very very far away! Then what better way to round of the day than a round of drinks at The Royal Oak in Dacre one of my favourite Dales pub stops! 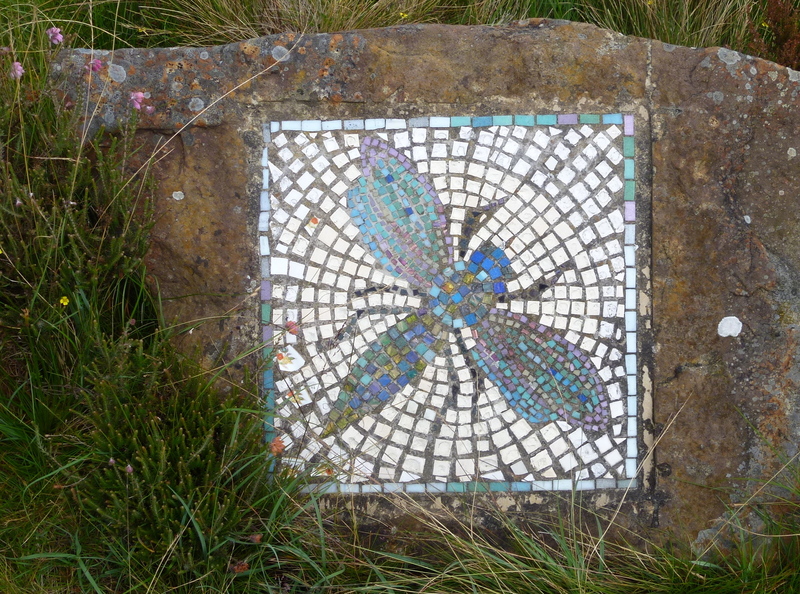 This entry was posted in Milady steps out and tagged Walks, Yorkshire. 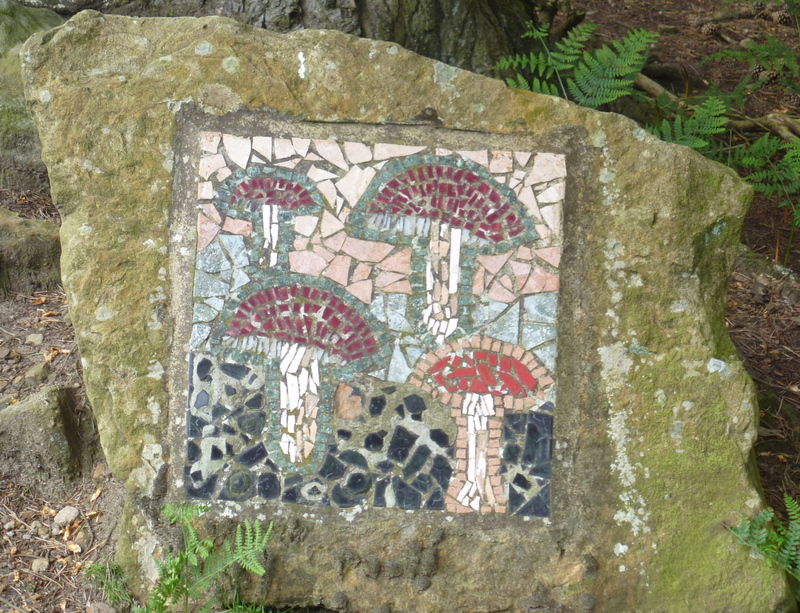 Short walk, good find !!! Yes, a good quotation, MN. I would have said … “but not in me”. There’s an exception to every rule! Thanks for visiting! 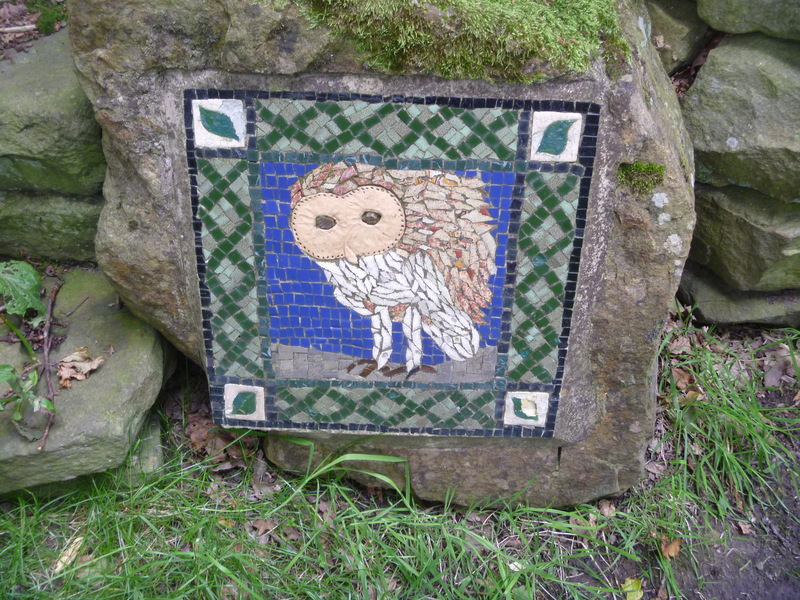 Thank you for your kind words on my mosaics and I am happy to answer any questions people may have about the fascinating art of mosaicing. 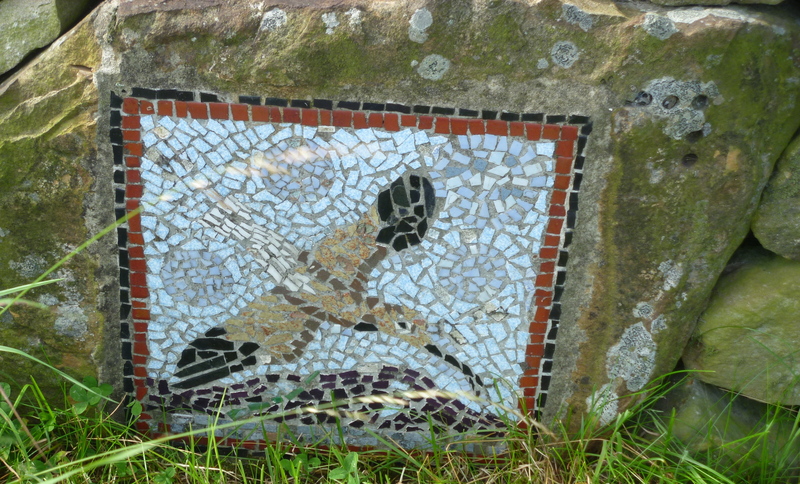 This Crackpots Mosaic Trail looks fantastic – what a great idea. Looks like we will need another trip up to the area in order to follow the trail. 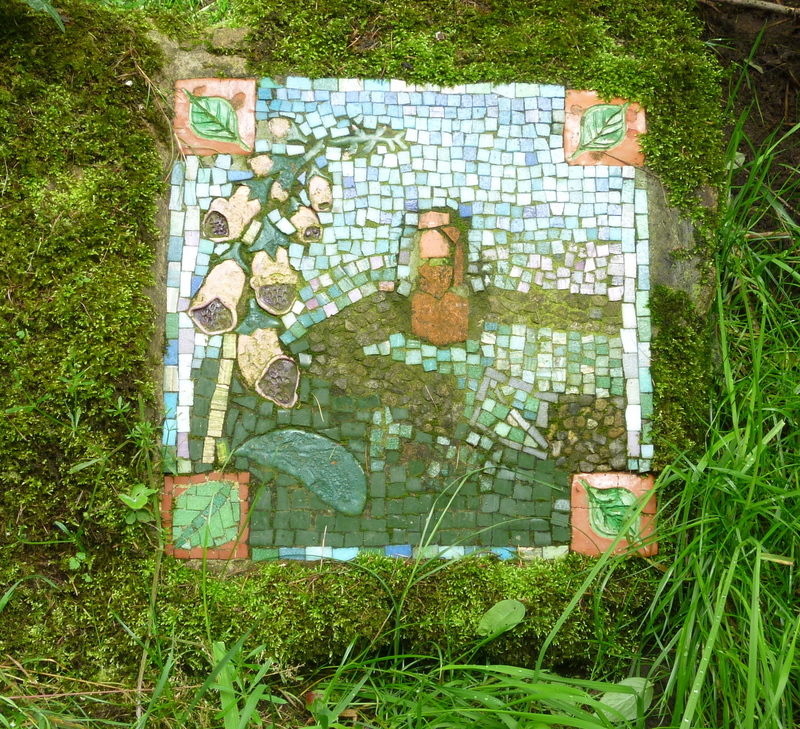 If anyone in the London area wants to have a mosaic trail, I know just the mosaic artist who can oblige!! Thanks for popping by, Rosanna. Just bank from our holidays and ready to start posting again.